Macris Industries creates world class, cutting edge products that fill discrete needs for those in the consumer, commercial and military sectors. Their products represent clean slate design. Initially performance criteria are specified, with the functional attributes taking precedent. Only once these performance metrics have been met or exceeded through intelligent engineering does the form take shape. The result is class defining products utilizing new technologies with commercial grade construction. Imtra is proud to have partnered with the Macris design team in developing a new range of ultra-flat LED downlights for the recreational marine and commercial markets. 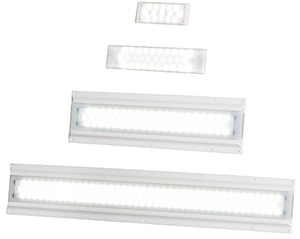 The IS Series Low-Profile LED Utility Lights is a cohesive family of surface-mounted LED fixtures designed to replace traditional types of water-proof, drip-proof, and explosion-proof engine & utility lighting (i.e. small cage lights up through 4’ fluorescent shop lights). The composite housings are UV resistant, impact resistant, and completely water-proof. When turned off, their opaque housings virtually disappear overhead. Download the IS Series Product Sheet NOW!